I would like to welcome all the Women Entrepreneurs (WE) to the Women Resource Center (WRC) I have been given the Responsibilities of Women Resource Center (WRC) after the new election. The basic objective of WRC is to facilitate the WE in all aspects relating to their businesses and their capacity building. 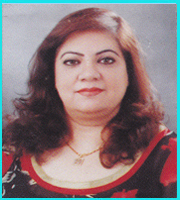 All women members of LCCI are advise to contact the staff on duty for any type of assistance, help or information. I request you to please contact the Sector Coordinators for your data updation. I have targeted my self to complete this by the end of May, 2010. On the basis of the data collection, I wish to develop guidelines for doing business in each of the sector identified have above. I will welcome all of your suggestions in this regard. From the Platform of WRC, I planned to organize few business clinics and Training Programs I will appreciate if you let us know the desired Training Areas so, Training Programs cold be need based and useful. All WEs are requested to join the LCCI web page at very nominal charges for their business promotion at the end I request you to please keep in touch and be regular in participation in chamber’s activities. This will be helpful to keep you well aware about the activities being organized by WRC.